"Beyond a facial, these are total sensory experiences!" 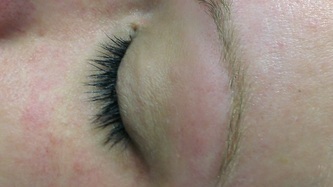 I give you results without needles or pain ~ yay! ​I have simplified my menu to the core of what I do best - bring people ~ and their skin ~ to a state of balance. ​I call this The TREATMENT. Your TREATMENT will be designed specifically for your needs that day: sensitive, dry, breaking out, need time to destress, whatever you need to reach that state of inner calm and peace and reveal your beautiful skin, that's what I do best. customized professional skin treatment given with grace by the master! ​The TREATMENT is my way of giving my clients everything I've learned while in practice for over 35-years! This is not a set formula, "step one-two-three" kind of facial, it's an intuitive dance. Yours may go a little like this ... with special surprises along the journey! A deep cleansing to remove makeup and oils prepping your skin for exfoliation. An aromatherapy massage of the face and shoulders! Professional-strength serums to correct deep within the cell. Therapeutic mask (or masks!) designed to bring balance to your skin. Then before you're ready to face the rest of your day, we finish up with the perfect moisturizer to hydrate and protect your skin. You will leave refreshed and rejuvenated ... with Vantastic SKIN! PLEASE NOTE :: The TREATMENT is designed to be deeply & therapeutically relaxing. Since blackhead extraction is less than relaxing, please let me know if you would like to be considered for this extra service. If you are too dehydrated and the extraction of blackheads would damage your skin, we will try extractions during your second or third facial, once the skin is healthier. "Two words: THE BEST. Nancy is just the best facial person ever!" You enter Vanities ~ YOUR PRIVATE SPA ~ and we lock the door to the stresses of the outside world, encasing you in the sweet aromas and soft sounds of your spa adventure. Your treatment begins with the gift of massage. You breathe in your favorite aromatherapy oils as we transition into a long, luxurious, decadent facial experience. But that's not all ... your hard working hands get the attention they deserve, as you sink deeper into your Vanities Zen Zone™, your hands receive a moisturizing massage and are tucked into a warm nest soaking in all that delicious nectar. Later you awake and glide gently into a new world, refreshed, restored and ready for anything! "WOW! THIS is what a spa day is meant to be!" ​​Meet MAX my multi-talented LIGHT ENERGY machine! ​This series is the core TREATMENT plus a new technology that utilizes broad-spectrum LED light to ENERGIZE your skin! A gentle but powerful way to improve years of sun-damage, heal wrinkles, clear blemishes, and give your cells youthful energy! It's so soothing as to be hypnotic, as the light gently flows over your skin directing energy that speaks to the cells causing a biological reaction to stimulate collagen and elastin; or calm it down in times of redness; or lighten and fade pigmentation; or purify when the skin has blemishes. Think of MAX as your exercise coach; one walk or gym visit will do you some good, but if you want DEEP CHANGE you have to increase your frequency. A fitness class (boot camp) is typically an 8-12 week commitment, same with MAX. One treatment will start the process, but for visible results it takes 8-12 weeks; along with correct daily home care for MAXIMUM results. Each session includes "The TREATMENT" facial as well as the MAX light energy treatment. PS, MAX has his OWN PAGE on this website, for deeper reading. "To be honest, when Nancy first told me about this light that would reduce my wrinkles, I thought, "Oh sure. Here's just another gimmick to take my money." You may be thinking the same thing. But, I will tell you that IT WORKS! I am "over-50", and have been an avid boater for most of my life. I wear sunscreen, but still had those vertical lines on my chest area. I signed up for the MAX Series of 12, intending to see results in my face, which I did, but I was surprised to find that even after eight of them the skin on my chest was getting better. I completed the series of 12, and now have a monthly facial to keep up my results. My chest "wrinkles" have all but disappeared! I am impressed, and I encourage all ladies to meet MAX and see how good your skin can look ~ at any age!" ~Linda G.
from your hairline to your toes, my gentle waxing technique will keep you hair-free for up to one month! ***Vanities ~ the leader in sensitive skin treatment ~ is one of the ONLY salons in the area that uses a selection of waxes to give you the best result and to keep your skin CALM! * Check out the “Q & A” page to learn just how easy it is to get started waxing, and please read what cautions and warnings exist concerning face and body waxing before scheduling. Women over 21 only. ACTUAL CLIENT'S BEFORE & AFTER PHOTOS - DRAMATIC! Great for Vacations & Weddings! ~ Gorgeous on Blondes & Redheads! 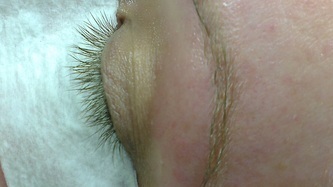 ~ Amazing on LATISSE users! :: a safe and simple method to color your lashes and brows. Results last up to 6-weeks. Excellent for vacations & weddings. $50 each :: ​Mix, Match, & Enjoy! Your head holds a surprising amount of tension. 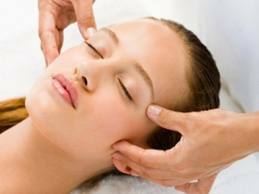 This pressure-point massage of the face, scalp, and shoulders will release decades of stress. When computer stress has taken it's toll, and daily wear and tear is just too much, a concentrated back massage is just the trick. Hands & arms ... you use them for EVERYTHING! Give them the TLC they deserve. Asian feet massage ... a bit of Reflexology from China, and a touch of Thai to ease away any pain. We're on them ALL DAY ... return the favor! you can't reach it, but I can! Enjoy this resort-style spa service ... just minutes from your home! Your back will be scrubbed to a silky softness and your muscles soothed with a wonderful aromatherapy back massage. I might even check for blackheads! Having a hard time finding a makeup foundation that truly flatters your skin? Vantastic Skin Perfectly-Matched Foundation will match and correct, giving your skin a natural, matte finish. You get nearly 2-ounces, which can last up to a year! If your skin color changes during the seasons, bring it in for a free touch up!